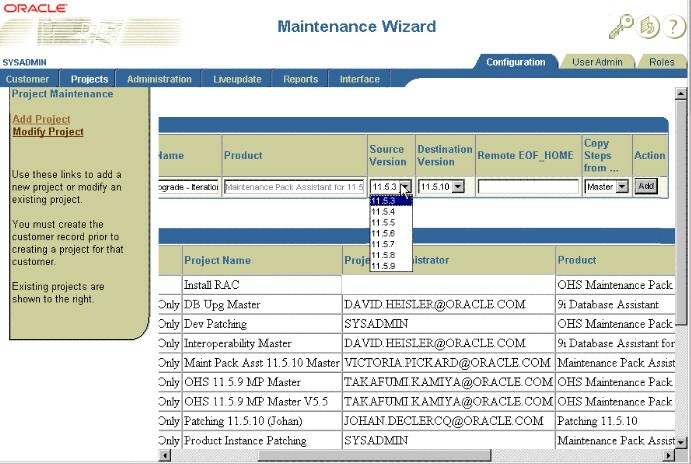 Oracle Metalink has recently announced the release of the new upgrade assistant otherwise referred to as the Maintenance Wizard. This post contains the details. Oracle Support provides a self-service tool (formerly known as E-Business 11i Upgrade Assistant) that guides customers in a methodical and repeatable way through the upgrade process. The Upgrade Assistant and Maintenance Pack Assistant are now part of a tool called Maintenance Wizard. Upgrade Assistant 11.5.10 was released on February 4, 2005 and is intended to help implementers upgrade Oracle Applications from 10.7 or 11.0.3 to 11.5.10. In March 2005 Oracle intends to release the Database Upgrade Assistant 9i for upgrading Applications databases from 8i to 9i. View Oracle Support’s Free Upgrade Assistance Data Sheet (Metalink User Name and Password required) or read the Maintenance Wizard FAQ. To download the latest version of the Maintenance Wizard visit Metalink Note 215527.1 entitled Master issue list for the Maintenance Wizard - this note provides you with a listing of all the releases from version 1.01 through to the current release, version 1.07. The diagram below also gives you some idea of what the Maintenance Wizard looks like. Lastly, for those readers who don’t have access to Metalink you can obtain more information at the official Oracle Upgrade Assistant Web Page. 11i10 was released by Oracle last week. This post contains the link to the new downloadable documentation CD (note if you have not already done so, you will have to register with OTN). The zipped documentation file is about 475MB and I understand it explodes to more than 1 CD now. There’s lots of new products and functionality - happy downloading and reading.